Sign Printing | Akron, Canton and Youngstown . 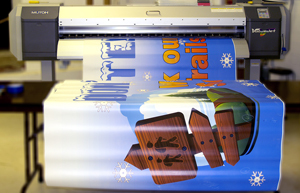 With Amos Sign Printing, It’s Always a Banner Year. Most businesses and organizations need signage at some point. But many don’t know where to turn to get the best sign printing solution for their needs. If you’re located in Akron, Canton and Youngstown, Amos Communications is always your best bet. From banners to large-format printing, Amos offers you the personnel and experience to create bold signage for your business. Our Acuity Advance expands the possibilities with the introduction of a white ink option, to complement the standard four color CMYK offering. Utilizing UV inks, the Acuity Advance delivers unmatched flexibility, allowing users to print a very opaque white under, over or between print layers. 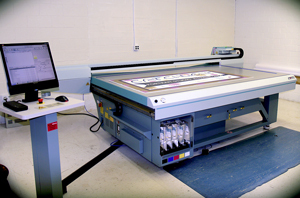 Our Fujifilm Acuity Advance UV inkjet printer has a LARGE Print Area of 1.25m x 2.5m (49in. x 98in. ), and prints onto substrates as thick as 48mm (1.98 in.). The Advance delivers near-photographic image quality, and includes a true flatbed platform to easily print onto a wide variety of rigid substrates. • Our ValueJet is a high-performance, high speed 64-inch wide printer for indoor/outdoor printing. • Prints beautiful, high-resolution images for both indoor/outdoor applications that last 3-4 years without lamination.